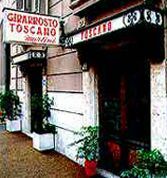 Lovely, grand restaurant with a famous antipasto of zucchine flowers, stuffed, deep-fried olives and such, but known especially for its bistecca alla fiorentina, a large porterhouse for two or three, grilled to perfection. A good restaurant for entertaining clients or for groups. Traditional, bustling Rome ambience.